I mentioned awhile back that I had some birthday money burning a hole in my pocket, and so I decided to buy myself a tree. I don’t think I mentioned that we also had a Crate&Barrel credit (some extra bucks we “earned” by purchasing a couch right after Christmas), but we did, and it was expiring early last week. We skimmed through the catalog, and looked at CB2 and Land of Nod, but honestly, there wasn’t anything we really needed from any of those places. And then I thought Tree. Planter. Tree. Planter. So I “bought” a planter. Back up to right after Christmas, when I also made another sizable purchase – the fabric for F’s Great Wall of Curtains project. Believe it or not, there is a link between these three items. You may recall that I drew out the fabric decision on F’s curtains for ages, and when I finally settled on the perfect swatch out of dozens and dozens, it just happened to be ridiculously expensive. Even with the once a year, 40% off sale. 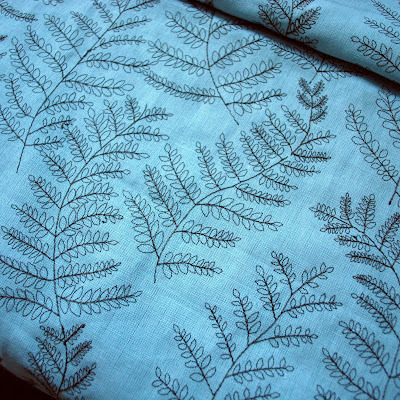 Still, I went for it – fabric only – and I decided that I could do the project myself despite the fact that I am terrified of screwing that fabric up. If I do, it’s gorgeous pillows for Christmas for everyone! Pillows stained with my tears, of course. I ordered the fabric in mid-January, and paid for it in full. Gulp. Seven to ten business days later the enormous roll of fabric showed up at my office with a rather large tear in the plastic bag at the bottom, and a distinctly gritty feeling about the whole the thing. I took it home that evening and unrolled it to great fanfare in the nursery, and it was absolutely filthy. Filthy. The damaged roll had apparently spent a good amount of time propped on end beside a delivery truck, holey end resting in a dirty street puddle. I know this because the entire bolt had wicked water and grit about 75% up the roll of fabric. It kind of smelled like wet asphalt and broken dreams. I could have just called and complained, but I knew they were going to make me bring a pricey roll of fabric like that back in to prove it, so I drove back out to the not-so-convenient suburban (nameless) store where I purchased said fabric, and I unrolled it to great fanfare across their counter. It was confirmed filthy, and they promptly ordered another roll of the fabric. Time ticked on and the fabric didn’t show. I finally called the store and they had no clue what I was talking about, so they called somebody that might know, and they told me that the fabric was back ordered til March. Or maybe April. Could be May, but they felt pretty sure it was April, and would I kindly call them back to confirm the date closer to the time? I continued to call once a month, and each time I had to recount the story while they told me I wasn’t in their system and was I sure that I purchased it under this name, my name? When I called again in early May I told them that I was quite certain that they should have the correct name in “the system” because they had no problem swiping that same-named card back in January when I purchased a pretend piece of fabric. The Emperor has no curtains! Still! My birthday in early April brought yet another year to pile onto the heap, and some birthday money. One of those things is fun, the other, not so much. I decided to counteract my aging sorrows with a fun gift that is also beautiful and green and perfect for the living room. 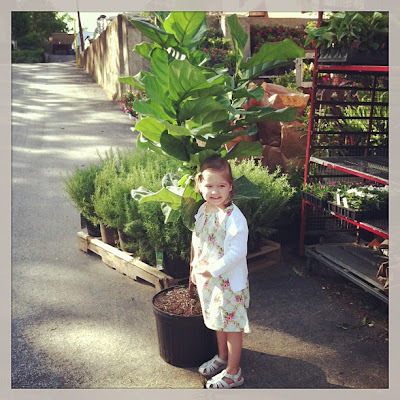 I looked around online briefly at local nurseries and ended up calling Rolling Ridge Nursery. I told them what I wanted and the lady laughed and commented on how popular that tree is, and she’d be happy to track one down for me, but it might take a week or so. If I wanted more of a plant shaped one, she could help me right away – but I didn’t want to coax and prune and tend my way to the gorgeous six foot tall beauty in my mind. I wanted to bring home a star. Every week I’d check in to see if they had found anything, and every week the same woman would tell me she had located one, but it failed to show up on the truck. She told me that this is her favorite indoor tree, but now that it’s “in all the magazines” it’s impossible to get one. I feigned ignorance – “Really? It’s in all the magazines?” By week five I was starting to give up. During week five I also received an email that my “free” money from Crate&Barrel was about to expire, so it was time to spend the credit or lose a good chunk of change. The weekend before the deadline M was out of town, so we emailed ideas back and forth to each other to no avail. There are so, so many cool things from all of those places, and I drool over that Land of Nod catalog every time it shows up on my doorstep, but the girls.do.not.need.anything. Buying something to be buying something is not my cup of tea. And then I thought about a planter! M loved that idea, and I knew it was perfect because one day my tree might really come home and it would most likely be planted in a black, plastic pot. I ran over at lunch to the store and was instantly greeted with around thirty planters to choose from. Ugh, decisions. I resisted the urge to buy the beautiful gold planter, although I loved the color and finish. I also loved some of the larger, minimal concrete planters, but I was determined to pick out something that my store credit could cover. 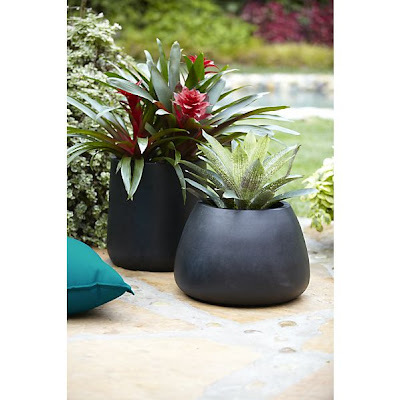 And then I saw the perfect planter for my tree – tall, simple, and in a nice matte black that will fade into the background and not upstage the tree (It’s the tall one). It also reminds me of our future fireplace, color and texture-wise. It tapers slightly at the top which is a nice detail, and it was also the same amount as my gift certificate so it was meant to be. I purchased it and then we waited for word from “the back” that they had located one. No luck. It’s back ordered til late June. So early last week I was sort of lamenting the fact that I keep handing over money for items that never seem to show up – sometimes even months later. What was more frustrating, at least about the fabric, was that I was the one continuously following up, and every time I would call it was like starting from square one with my explanation. I was feeling a little annoyed by the whole process, and starting to wish I had all my money back rather than just waiting on fabric and trees and planters that never show up. 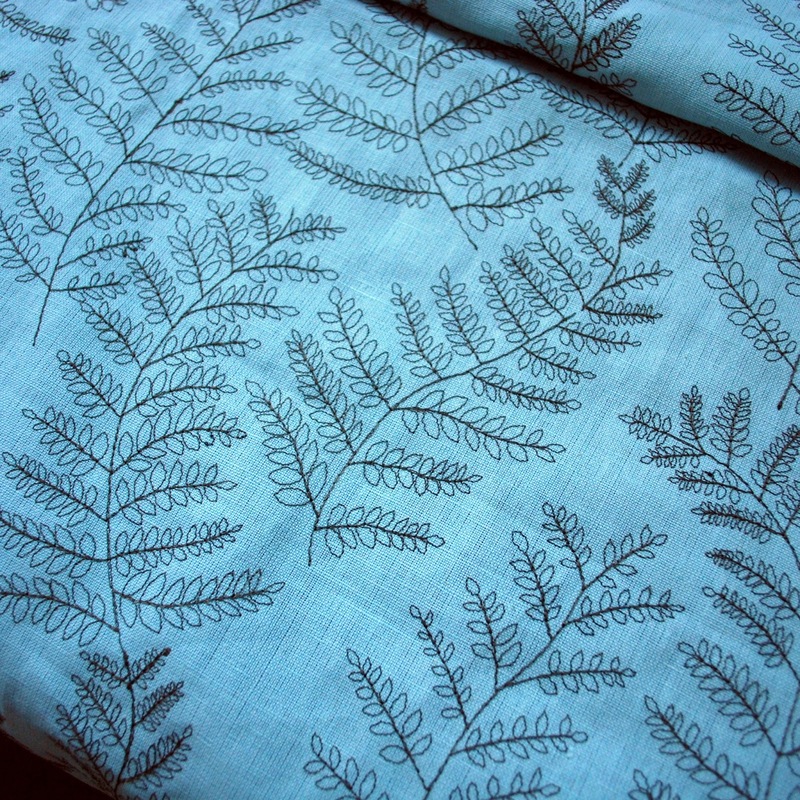 So now I have fabric – and any delays on this project now are mine only. And now I have a tree, and it’s absolutely perfect in the living room, even though the corner where it will reside is stuffed with items for a possible sidewalk sale (if I can get up the nerve and manage the time – both seem doubtful). I’m a little nervous about caring for this tree – it was not inexpensive – but it looks so great in this room, and really softens the edges of all the crisp hard lines in the room. It will grow as high as we let it grow, so pruning and watering and protecting it from drafts (honestly? how to do that when the source of light is a 128 year old single pane window with a heat / ac register below it?) are all in our hands, so we’ll see how this goes. The internet is so magical in the way that you can search for care instructions for any plant imaginable and manage to find one hundred different (and conflicting) ways to water it correctly. The planter will eventually come and we’ll transplant it into its permanent home. The curtains will get made, and F will stop complaining about how bright her bedroom is at bedtime and find another stalling method. And the tree will go to the ceiling, and now I’m wondering where the heck we’ll even put a Christmas tree this year. 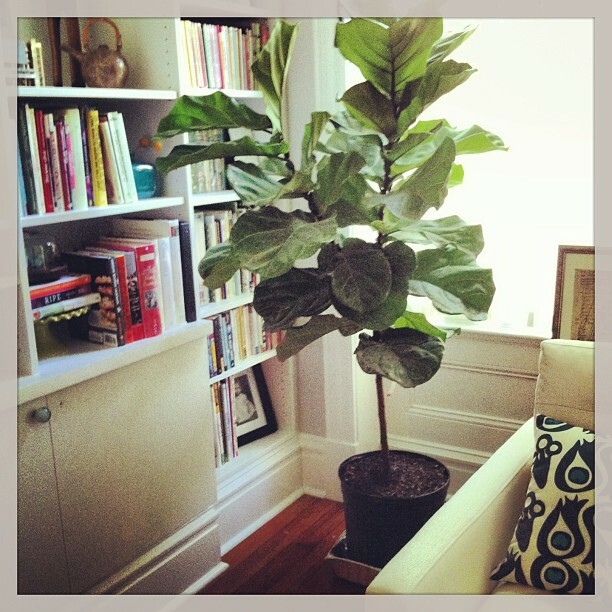 Unless it’s a fiddle leaf fig.